When I first sampled the Nail Effects, I really wasn’t that impressed with it. But having seen so many people use it especially on my friend’s nails (which you can see here) I decided to give it another go. The nail polish has been on since Saturday and has lasted quite well. It is starting to chip, but the crack effect takes attention away from the chipping. I think it’s due to the colour combination that makes the above Nail Effects successful. I have been able to go work to work with these nails and I have received nice comments about the nails – from the women obviously, because the guys in office don’t tend to notice changes straight away! I think will try to experiment with other colours……. 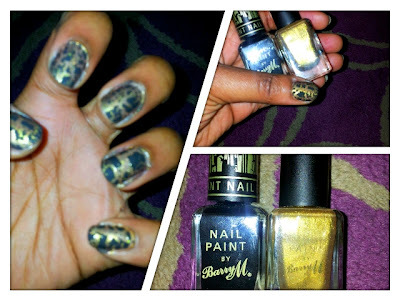 Have you tried Nail Effects? Which colour combinations do you recommend? I love the crackle polish. I've yet to try it out but always love it when I see others rocking it. :) Hopefully I can try it soon. Great post. I really like your nails...super cute. it would be nicer if you could follow back.